On the Trail of Adventure! 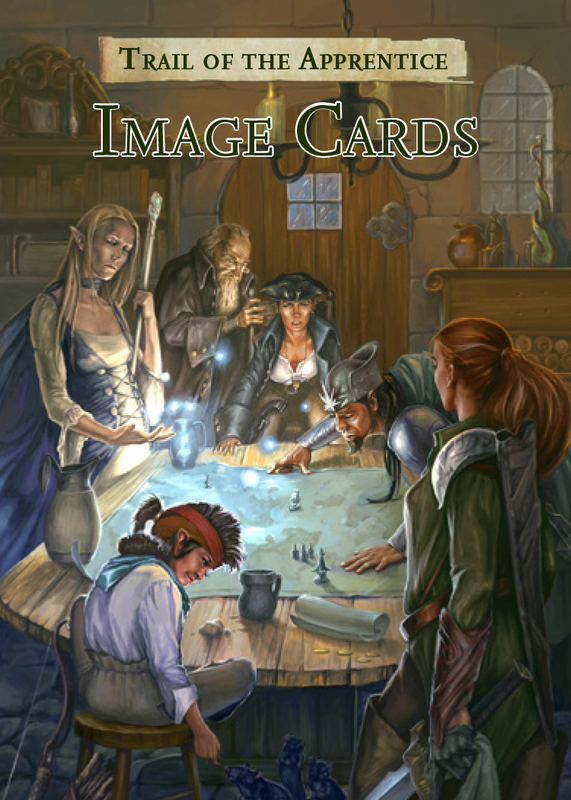 The Trail of the Aprentice Image Cards are a handy accessory for the 5-part Trail of the Apprentice adventure saga featuring 44 cards. One side of each displays a creature or character portrait, from adversaries like orc bandits and kobold rogues to hell hounds, hags, elementals, and even Kezzerex the black dragon to an assortment of allies and associates from the inquisitive alchemist Ithamar Ruggles to Revien the Seer, including the seven sample iconic characters from the adventure compilation. In addition, the opposite side of each card shows one of the incredible full-color illustrations from the Trail of the Apprentice Adventure Path, from lizardfolk swamp scouts to orc raiders in The Bandit's Cave to the climactic confrontation with Belazeel himself in The Wizard's Dungeon!